If you’re looking to improve your cardiovascular health and overall fitness levels, getting aerobic steppers can be an excellent starting point. They work by utilizing the stepper in a variety of choreographed motions. As an aerobic exercise, it can give you an effective total body workout. Along with that, exercises can be scaled to your level of comfort and expertise. This level of customizability includes increasing the tempo, incorporating more upper body motions, or increasing the resistance of the stepper. 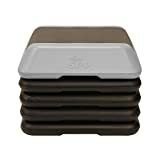 One of the key features to look out for is a sturdy base with a non-slip surface. Safety should be your primary concern, and these aerobic steppers should be built to last. Plastic, rubber and polyethylene and among the most used materials. Another important feature is an adjustable height since this allows users to vary their resistance levels quickly. Larger surface area for stepping and max weight capacity can be important as well. Finally, the colour and style, as well as extra features like workout DVDs, are great additions. Coming in either black/ grey or a retro teal/black/purple styles, this aerobic stepper is well-built and effective for workouts. While it may seem simple in appearance, the high-density plastic and slip-proof top may make it a strong product. The rubber floor pads prevent sliding, and they are non-marking. If you’re looking for a budget stepper to just get started, this model from Tone Fitness is highly recommended. 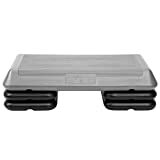 It offers a non-slip step surface that is secure at all times. It can adjust to either 4″ or 6″ in height. Higher elevation means you have to move further and faster to maintain the same pace, which increases the resistance. This stepper is great for users of all fitness levels, and it helps build strength and endurance. For beginners, it comes with a workout chart that provides some instructions and examples exercises. If you’re searching for a cheaper alternative to a square style, high elevation stepper, this is a solid purchase from The Step. It is lightweight, and can adjust up to a height of 14″. 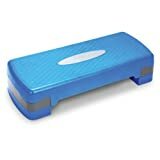 It features the standard slip-proof surface and has a max weight limit of 225 lbs. The 16″ x 16″ stepping surface offers a balance between compact design and effective space. The high rise stepping style is excellent for more intense lower body exercises, as well as advanced aerobic stepping patterns. This simple, yet effective tool will help kick up your fitness levels, without being a strain on your wallet. For users seeking a more inclusive workout experience, check out this deck. It is smartly designed with specific zones at optimal distances in order to provide a more advanced challenge for steppers. In addition to its sturdy base and non-slip surface, it can double as a bench for lifting free weights and even includes incline capabilities. The bench features steel rods as support, adding to its already impressive stability and strength. It is designed with rounded edges for more comfort while laying down on it. This versatility makes it an invaluable tool in any personal home gym. This stepper from The Step is more than just a simple tool, it is a system that promises great results. All of the parts are made from a high-density polyethylene, giving it a rugged shell. The 11 by 25-inch surface gives plenty of room for a variety of stepping patterns. 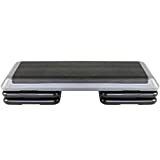 Along with the standard 4 risers and non-slip surface, it comes with a 45 minute All Step training DVD that prepares you to maximize your stepper to the fullest potential. This budget-friendly stepper features a unique design and compact shape. It features two-level cardio and strength training capabilities. It ranges from 4 and 6 inches in height, for varying levels of difficulty. The textured, slip resistant top is effective at gripping as you step, while the PVC plastic construction and included DVD workout guide add even more value. It doesn’t require any additional assembly, and there is a 90-day warranty. This heavy-duty stepper from The Step is a great beginner gateway into aerobic fitness routines. It comes with 4 violet coloured risers, which allows it to adjust from 4″ to 8″ in height. The stepping surface is a gracious 11 x 25 inches, and it can support up to 300 lbs. The non-slip surface ensures that there isn’t any hassle when operating the stepper. Whether you’re a beginner who wants to shed some pounds or a seasoned veteran, the included All-Step DVD is an amazing and informational addition to this product. If you’re looking for a stepper with a potential higher elevation than the standard models, check out this one from Trademark Innovations. 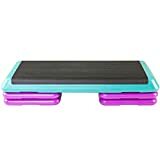 Coming in blue/black and pink/black, this modern stepper is great for the calf, thigh, and glute workouts. It features a set of 4 risers that have a maximum height of 12″. The non-slip surface ensures your safety, while the 16″ by 16″ stepping area gives you plenty of space for a variety of workouts. With its sleek and sturdy design, this aerobic stepper from Reebok is a great pickup for any fitness enthusiast. It combines compact design with versatility, with tons of novel and effective ways of working out with it. It can adjust to the standard 6″ to 10″ in height within 3 increments, while the top surface features a non-slip textured mat. The simple colour scheme of orange with grey gives it a modern feel and contrasts well with any style. Built for circuit training, this aerobic stepper is surprisingly tough and compact. It has an 11″ x 25″ stepping surface and can adjust from 4″, 6″ and 8″ in height. This compact shape makes it perfect for on-the-go workouts for both beginners and experts. It can support up to 275 lbs and includes 4 black riser support blocks. The tan/black colour gives it a nice neutral aesthetic that doesn’t clash with the rest of your style.